Home » Food Processors & Mixers » Hand Mixers » What is the Best Rated Hand Mixer in 2018? If you are still using a wire whip, and manual potato masher to whip, stir and mash your favorite dishes, stop; you need an easier way. A hand held electric mixer is affordable and best suited for light tasks like making fresh whipped cream, fluffy mashed potatoes and mixing soft cookie dough or cake batter. Some have the power to mix hard cookie and bread dough and come equipped with dough hooks as well as wire beaters instead of traditional center posts that are hard to clean, giving you more versatility of the use of your hand mixer. The best rated hand mixer options for home use are even suitable for frequent use. Motors that are more powerful, with more speeds and useful attachments are available with today’s lightweight top rated hand mixers. This enables you to start at very low speeds for mixing dry and wet ingredients together without having them fly out of the bowl, yet gives you the power at the end for whipping cream, or sugar and butter for your favorite confections. Some hand mixers have the power required by avid cooks who do a lot of different mixing jobs, while others are more suitable for those who need a mixer now and then but do not require the power to mix bread dough or make meringue. Note, that while a good hand mixer is fine for small batches of bread dough, it can still be quite a strain on the arm, as it does take time for it to come together. If you’re a frequent bread baker but don’t want a dedicated bread machine, we recommend getting one of these good stand mixers that do a great job with kneading bread dough. 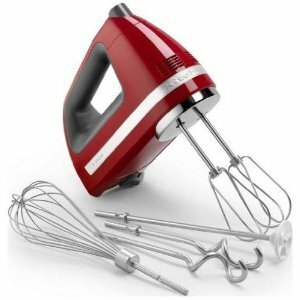 So what is the best hand mixer to buy? Read on to find out! You’ll want this mixer at hand and easy to access, as its efficient motor has the power to whip, beat, liquefy, knead and mash. In addition to the hand mixer attachments, the Kitchen Aid KHM920A Mixer comes with turbo beaters, dough hooks, a whisk and a liquid blender rod, all in stainless steel. It also includes an accessory bag so that you don’t misplace any of the parts. Nine speeds will give you the ability to start at low speeds first with a soft start feature to incorporate all the wet and dry ingredients first before switching to higher speeds for various tasks. The top speeds can be used for tasks like beating egg whites for fluffy pie meringue. Switching between speeds is as simple as using your fingertips to press a button, and each level is digitally displayed on an LED panel to let you know what the current speed is. It is comfortable to grip even for long periods of time as the grip is ergonomically designed, so even long jobs like kneading bread dough is easy. The swivel cord makes it easy for right-handed and left-handed people to use and locks into place to stay out of your way during mixing. When you want to pause in the middle of mixing, you can set it down on its heel without worrying about it tipping over. Or, you can use the easy eject button to remove the beaters when you’re done. The Kitchen Aid digital display hand mixer receives high praise from reviewers. Some even said that this is the best hand mixer for mashed potatoes if you don’t want any lumps left. One reviewer found that the digital display helps to find the proper speed setting. The ultra-low start up speeds of the mixer where mentioned by several, stating that the slowest setting kept every bit of the ingredients in the bowl instead of splattered around the kitchen. The Cuisinart Power Advantage also offers the power of nine speeds, and comes with a snap on carry case to store your beaters, dough hooks, wire whisk and spatula, which are all included with this mixer. The powerful 220-watt motor of this mixer has the ability to mix all kinds of ingredient compositions and you turn it on or off using a simple button. You can increase or decrease the speed of the mixer using the one-touch positive and negative speed controls. A small LED display lets you know which speed you’re currently on. Included in the levels are three low start speeds to keep batter from splattering all over yourself and the kitchen in the beginning. Another top pick by reviewers when looking for a best rated hand mixer, the Cuisinart Power advantage is a performer and most claim that is has plenty of power. The fact that the beaters have a latch release as opposed to a release button is a plus for one reviewer, because accidentally hitting a release button before you’re ready to can make for a mess in the kitchen. Several reviewers found that the dough hooks don’t work as well as they had expected and that mashed potatoes also didn’t turn out too well. If these are two frequent jobs that you need your mixer to do, get the KitchenAid 9 speed mixer above. If you like KitchenAid mixers but don’t want to spend too much on one, consider the KitchenAid Ultra Power 5-Speed Mixer. While you don’t get the additional accessories, the sturdy stainless steel turbo beaters are enough for mixing soft cookie doughs and even mashing potato. You get an ample selection of 5 speeds from slowly stirring in ingredients at the start to whipping cream or egg whites for dessert. However, this is not the mixer for frequent bread bakers or meringue lovers as it is a low power machine. The other features, like swivel locking cord, beaters eject button and lightweight comfort grip remain the same as those on the 9-speed. This mixer is available in a variety of cheerful colors so you can choose one that matches your kitchen decor. Although this mixer does not have a slow start feature, reviewers say that the lowest speed is a true stir speed so you won’t get batter splashed everywhere. They all say that if you want a mixer for more demanding tasks, you should get a stand mixer. Otherwise, this one is high quality and is perfect for everyday low power mixing jobs. For more versatility and power, the Hamilton Beach 62650 6-Speed Classic is the best hand held mixer for the money. It comes with traditional and wire beaters and a whisk and comes in at 290 watts so you can use this mixer for almost any job except bread making. It is built with features such as “quick burst” for that short and sharp burst of power, and a bowl rest to allow you to rest the beaters or whisk over the bowl to catch drips. This is another hand mixer with stand storage via a snap on case which keeps the cord and all of the attachments in one place. The addition of the bowl stand makes this an easy to use, convenient mixer. Reviewers found the stainless steel housing to be easy to clean and found its power suitable for their needs. Unlike the Kitchenaid mixers, this one does not have a swiveling power cord, so left-handers may find it a bit of a pain to use. However, the grip is just as comfortable. The Oster 240-watt 5-Speed Hand Mixer has the power to do the job if you are OK with just 5 speeds. That won’t be a problem for this mixer, though. Its 240-watt motor has the power to get the job done, whether that job is a batch of cookies or bread or fresh whipped cream. In addition to the beaters, you also get a pair of dough hooks. The Burst of Power feature lets you power through the tough tasks when you need to. Reviewers like the slow start up speed of the Oster hand mixer along with the ability to use extra power when needed. The one complaint that a reviewer hand is that the mixer has a tendency to tip over if set upright with the beaters or hooks in. ← What is the Best Toaster Oven to Buy in 2018?